Telecommunications company Ericsson has released its latest mobility report which predicts that in the next five years, the number of smartphones subscriptions in the world is expected to reach 4.5 billion, with 60 percent of the world’s population covered by LTE. Other findings show that with the proliferation of better network speeds, video traffic will also grow by 60 percent annually and data traffic volume will grow 12-fold by 2018. “Owing to the build out of WCDMA/HSPA, network speeds have improved, and so has the user experience,” says Ericsson’s Senior Vice President and Head of Strategy Douglas Gilstrap. He says that the company believes LTE subscriptions will surpass 1 billion in 2017, driven by devices that are capable of supporting more multimedia content. With more people sharing photos on Instagram, Facebook, YouTube, and Twitter, should we be surprised by the fact that faster network speeds are becoming available throughout the world? Ericsson says that smartphones accounted for around half of all mobile phone sales in Q1 2013, 10 percent more than the same time last year. 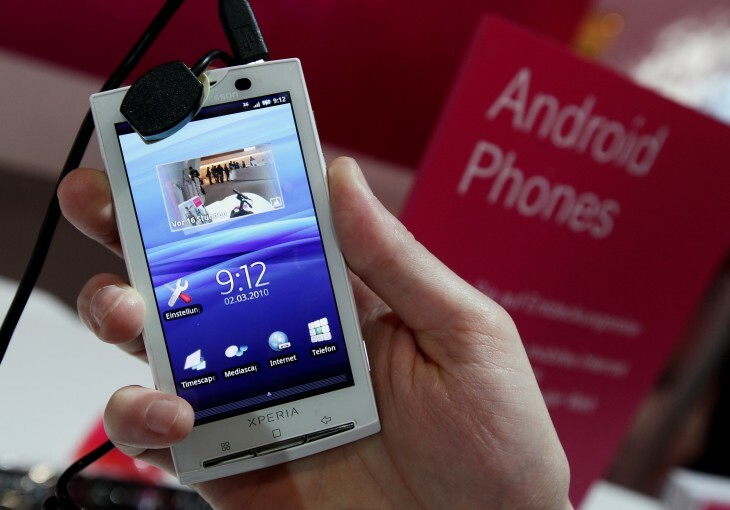 What’s more, the number of total mobile phones increased by 8 percent year-on-year by Q1 2013. The company breaks the additions down by network speed, with WCDMA/HSPA adding 60 million subscriptions, GSM/EDGE-only increasing 30 million, and LTE growing by 20 million. It also says that mobile broadband subscriptions grew at a faster rate during this same time period to 1.7 billion. 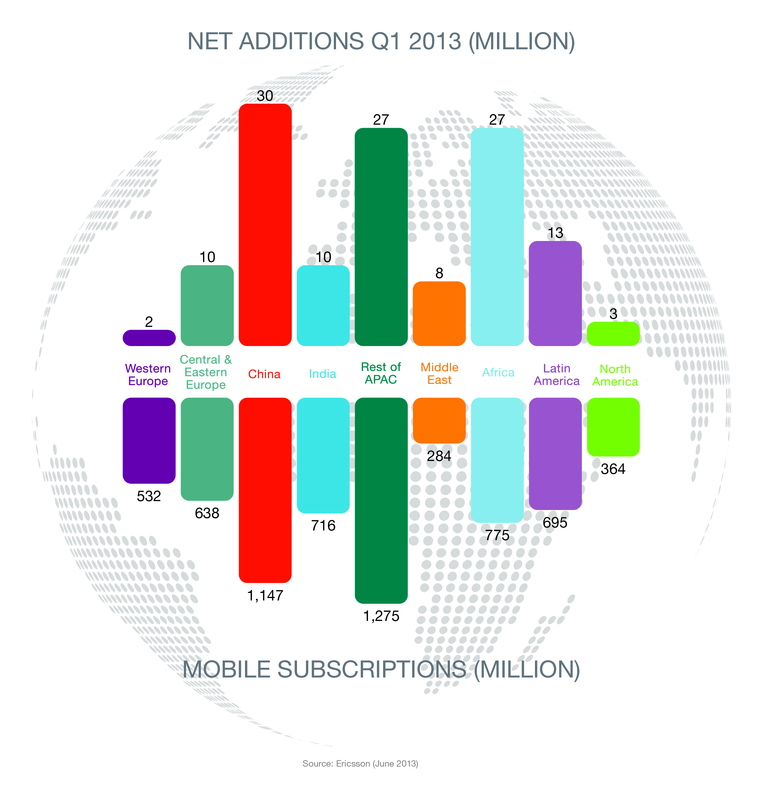 Broken down by regions, Ericsson says that China, Africa, and the Asia-Pacific parts of the world led the charge both in the net additions and total number of mobile subscriptions. Where is the biggest penetration in mobile technology? Europe. Globally, this number is at 90 percent, but there in Central and Eastern Europe, that number is 132 percent while it’s 128 percent in Western Europe. China, Africa, and India are the three main regions that do not have a penetration rate above 100 percent. The mobility report states that LTE is estimated to reach around 2 billion subscriptions in 2018, representing the high-end share of the total subscriber base. Ericsson says that rapid migration to more advanced technologies in developing countries will help decrease the number of phones running on GSM/EDGE-only networks. Ericsson’s mobility report goes on to talk more about usage behavior, the impact of applications, and traffic. You can read the entire report here. Update: The embedded report has been removed due to Ericsson claiming copyright infringement for us posting the report here, even though they sent it to us. The link above still works though.